iPhone 4G Screen – video showing the unpacking of an iPhone 4G screen. 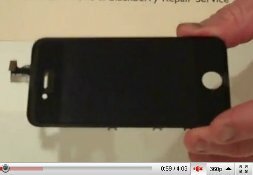 This video was posted by CrunchGear, and it shows the unpacking of what is said to be an iPhone 4G screen. The point of the video is to show that the iPhone 4G has a little bit of a longer screen compared to the iPhone 3G, and it appears to be thinner as well.